Back zipper; 65% cotton lace 35% polyamide. Belt not included. Model in beige wears size medium in Dainty Jewell's. Model in Tiffany blue wears size small in Dainty Jewell's. Model in blush wears size small in Dainty Jewell's. Model in radiant orchid wears size small in Dainty Jewell's. Model in emerald wears size small in Dainty Jewell's. I bought the wrong size the first time but after that my XL came, so beautiful. All was perfect. Thank you! This is an absolutely beautiful dress! I ordered it in Royal Blue, and it's stunning. Perfect for dress or even semi-formal events. The dress does run small. I typically wear a size small in Dainty Jewell's dresses (ladies size 4/6), but I had to size up to a medium for this particular dress. This dress met all expectations! Very nice quality & feels amazing on. My daughter was so happy! 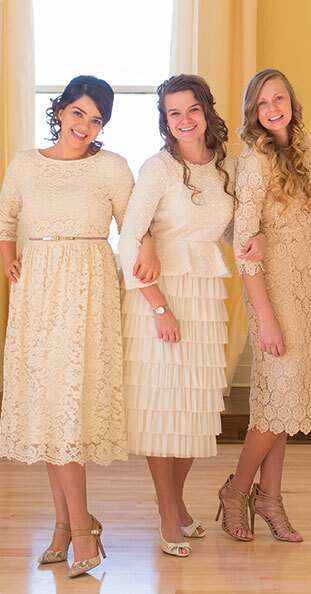 Order these for my bridesmaid and I absolutely loved them! Will get one for myself . The material is very good quality, the dress came quickly and everything came out perfect! 10/10 would recommend! I got the navy blue dress and i love it. I love the fabric and the color. It is perfect for semi formal to formal events. Beautiful! The style somehow reminds me of those worn in Colonial America - I am so incredibly delighted with this lovely dress! I loveeeee this dress! I recently ordered and needed it by a certain date. They made sure I’d get it in time at no extra charge to me and it fits perfectly! The color and the shape is beautiful. I got the Tiffany Blue - M. This dress is absolutely lovely! It fits me high waist and then the dress is loose at the bottom. It falls right on my calf and I am 5'1. I love it... its super cute! !